Learn from the latest research on stress and retirement planning as the Van Hulzen education team shares 5 strategies to eliminate the stress. We spend so much of our lives anticipating the future. When it’s something as important as your retirement, that anticipation can easily bring stress to your everyday life. If you’ve been worrying about your retirement, you’re not alone. As a result of longer life expectancy and new retirement realities, confidence in retirement future has declined. And at least 30 percent of people say it brings stress into their life at work or at home. Maybe most alarming, reports have suggested the lack of confidence in founded in reality. According to the National Retirement Risk Index, 59 percent of families are at risk to lose their standard of living in retirement. That’s probably not what you have in mind when you picture your retirement. We want to save for important, meaningful reason. Not out of fear. What are you doing today to save your dreams of the future? In the “5 Strategies for Stress-Free Retirement Planning,” we share some recent research and advice to help you find the right kind of retirement preparation. The number one strategy is “Plan” because it’s good for now and for later. Studies have shown that the most effective way to counteract stress is planning ahead. Importantly, it makes a difference in your future too. With a retirement plan, individuals save more money than those who don’t. The second strategy we outline is “Communicate.” Most likely, this isn’t just your retirement. It’s a life you will share with your spouse and other people important to you. Make sure to take the time to process it together. 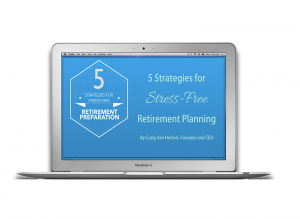 Download the “5 Strategies for Stress-Free Retirement Planning” to find more strategies today!